The Spartanburg Phillies came back from a mid-game deficit in this June 1993 contest and Mike Murphy was credited with helping spawn that victory, according to The Spartanburg Herald-Journal. Murphy did so with a run-scoring bunt single. "(Murphy's bunt) was a huge play," teammate Steve Soloman told The Herald-Journal. "It gave us a lot of momentum." Murphy's own momentum carried him to a career that spanned 12 seasons. But it could only take him as far as AAA. Murphy never made the majors. Murphy's career began in 1990, taken by the Phillies in the sixth round of the draft out of St. Pius X High School in New Mexico. Murphy's career began at rookie Martinsville. He played nine games that year and returned to Martinsville for 1991. He made short-season Batavia for 1992, then single-A Spartanburg in 1993. At Spartanburg, he hit .289 in 133 games. He also knocked in 60 runs and stealing 30 bases. 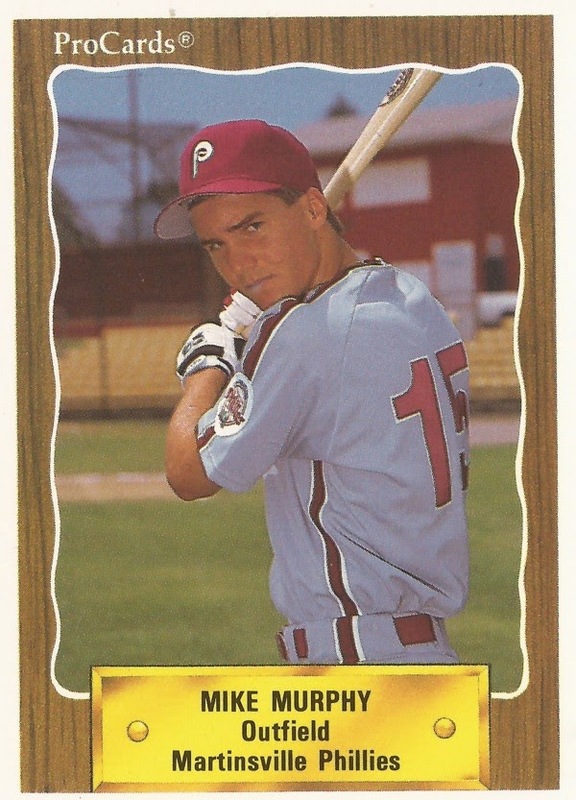 Murphy won Phillies minor league Player of the Month honors in May 1993. He hit .351 for the month. He was 2 for 4 in a June game. Murphy moved to the Blue Jays system and high-A Dunedin for 1994. He played in the Cleveland system for 1995, getting his first look at AA. From 1996 to 1998, Murphy played in the Rangers system. He played 34 games at AA Tulsa in 1996. He also played that year at high-A Port Charlotte, making the Florida State League all-star team. His first time at AAA came at Oklahoma City in 1997. He hit .329 in 73 games there. He moved to the Orioles system in late 1998, returning to AAA Rochester for 1999. From 1999 to 2002, Murphy played in four different systems, the Orioles, Mariners, Rockies and Astros. His final 15 games came in 2002 with the Astros at AAA New Orleans. Murphy ultimately played in 13 seasons. He spent time in five of those at AAA, but none in the majors.